COVINGTON KY (12-06-08)-The storybook ending to the 2008 ARCA RE/MAX Series came this weekend at the Northern Kentucky Convention Center in Covington, Kentucky, where young Justin Allgaier closed out his ARCA RE/MAX Series career as the Series' first new champion in nearly a decade. Justin and Ashley Allgaier, car owner Mike and Dorothy Allgaier and crew chief Jim and Jackie Pohlman were formally honored onstage as the 2008 Championship Team, officially concluding a season that included six different point lead changes among five drivers over the course of a 21-race schedule. By earning the 2008 title, Allgaier ended Frank Kimmel's unprecedented streak of eight consecutive titles and became the first non-Kimmel Champion since Bill Baird in 1999. Allgaier, in family-owned equipment and a shoestring budget, won the last three races of 2008 and overcame a 105-point deficit in the final race of the season at Toledo Speedway to earn his career first National Series Title at just 22 years old. His 2008 ARCA RE/MAX Series accomplishments were among the factors leading to a contract with Penske Racing to compete in the NASCAR Nationwide Series in 2009 and Penske officials were among the close to 500 attendees at Saturday's Championship Awards Banquet. Penske Racing President Tim Cindric served as the Guest of Honor, noting the strength of the Penske brand and the company's long history with ARCA. 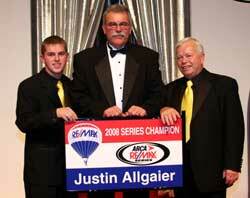 As the 26th different driver to earn an ARCA RE/MAX Series Championship since the inaugural 1953 season, Allgaier and the championship winning team picked up more than $160,000 in point fund and special award prize money with onstage sponsor presenters to include ARCA President Ron Drager, Bud Talbot from Sunoco, Dave Wroblewski from Hoosier Tire, Chuck Stranc from CGS Imaging and Mickey Holmes from Lincoln Electric. The Allgaiers also received cash or product certificates from Crane Cams, Mo's Gold, JE Pistons, SW Scales by Intercomp and Bilstein Shocks. Allgaier was presented with a letter and certificate signed by Illinois governor Rod R. Blagojevich to acknowledge his accomplishments, along with an ARCA Championship Ring from ARCA President Ron Drager, a tradition that began in 1964. On behalf of RE/MAX, Int'l Vice President Randy Morse, Drager presented both Justin and Mike Allgaier with ARCA RE/MAX Series Championship Leather Varsity Jackets along with a point fund check. Separate and apart from the Championship celebration, ARCA President Ron Drager presented car owner Mike Allgaier with the Marcum Award, which is given to an individual or entity whose positive efforts have elevated ARCA's motor sports stature to the benefit of all associated. Allgaier's tenure in the ARCA garage spans four decades and before his son Justin was old enough to drive, Mike Allgaier served as a Hoosier Tire distributer in the ARCA RE/MAX Series, often supplying tires to cash-strapped teams and granting amends on their invoices in the interest of competition and healthy car counts. The top-20 point finishers received point fund checks, including second-place driver Frank Kimmel, who posted the 17th top-ten points finish of his career, missing out on a tenth ARCA RE/MAX Series Championship by just 50 points during his first season as a driver/owner. Kimmel, joined on stage by his brother/crew chief Bill Kimmel as a representative of the team's ownership group, was formally presented with the 2008 Bill France Triple Crown Award. He also received a check for $2,500 by Racing Electronics representative Corey LaCosta for earning the 2008 RE Lightning Challenge. Matt Carter and car owner Larry Clement were honored for their third place points finish. Carter was also a part of the Special Awards portion of the banquet as the recipient of the 2008 SunTrust Rookie of the Year Award and its $10,000 cash prize. 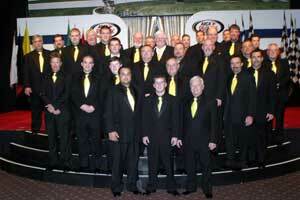 As the 2008 Rookie of the Year, Carter also received a check for $2,500 from Hoosier Racing Tires. 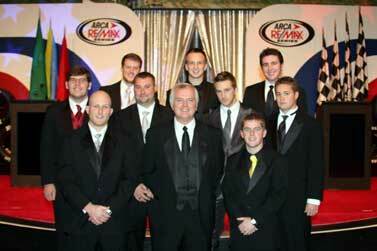 2008 marked one of the most competitive rookie classes in ARCA RE/MAX Series history, with six rookies among the top-10 point finishers. Banquet attendees were treated to a video presentation highlighting the rookie battle. Ricky Stenhouse, Jr. was honored onstage for finishing fourth in the final point standings, joined by Roush Fenway Racing representative Eric Peterson. 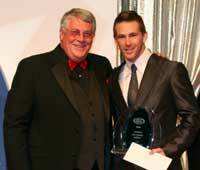 Scott Speed, who finished fifth in the final ARCA RE/MAX Series Point Standings, took home a large portion of the Special Awards, including $5,000 cash from Aaron's Chief Operating Officer Ken Butler, II for earning the 2008 Aaron's Lap Leader Award and $5,000 for earning the most SIM Factory Pole Awards over the course of the season. Speed was joined on stage by car owner Eddie Sharp, who received a check for $15,000 from Hoosier as the 2008 Hoosier Tire Superspeedway Challenge Champion. Sixth place driver Patrick Sheltra was joined on stage by Sheltra Motorsports Team Manager Keith Strunk, who represented the ownership group. Greg White, National Sales Manager for the Casite Company, presented Sheltra with $2,500 for earning the Casite Hard Charger Award. John Wes Townley was honored onstage for finishing seventh in the final ARCA RE/MAX Series Driver's Point Standings, joined by car owner Robby Benton. Tom Hessert, III was honored onstage for finishing eighth in the final ARCA RE/MAX Series Driver's Point Standings, joined by car owner Jennifer Belmont. Tayler Malsam was honored onstage for finishing ninth in the final ARCA RE/MAX Series Driver's Point Standings, joined by Cunningham Motorsports ownership group representative Mark Gibson. Tenth place driver Ken Butler, III was joined onstage by car owner Eddie Sharp. Additional drivers honored included Dexter Bean (finished 11th), Bryan Silas (finished 12th), Justin Lofton (finished 13th), Darrell Basham (finished 15th), Brad Smith (finished 17th), Donny Kelley (finished 18th) and Norm Benning (finished 19th). Bean was also presented the HG Adcox Sportsman of the Year award by presenter Herb Adcox. Long time car owner Andy Hillenburg, a former driver himself and current owner of Rockingham Speedway, was presented with the ARCA Spirit Award for his dedication and support of ARCA, his uplifting spirit by way of example and perseverance and positive attitude. As has become tradition, $12,000 in scholarship monies were distributed for higher education, including Bob Loga Memorial Scholarship recipients Frankie Kimmel and Deidra Young and University of Northwestern Ohio scholarship recipients Justin Bischoff, Jordan Carter, Michael Ross, Anthony Hites, Jonathan Griese and Andy Quillan. Andy O'Neal, Dean of the UNO College of Technology, was among the speakers at the awards banquet. Eddie Sharp Racing's Patrick Donahue, who navigated first year driver Scott Speed to a fifth place points finish among four wins, ten top-5 and 17 top-10 finishes, was presented with the Cometic Crew Chief Award, along with $3,000 cash. Bobby Writesman presented the Holley Engine Builder award to Ilmor Engineering. Dave Dixon accepted on behalf of the company. ARCA RE/MAX Series host racetracks with representatives in attendance included the Illinois State Fairgrounds and the DuQuoin State Fairgrounds (Bob Sargent), Rockingham Speedway (Andy Hillenburg), Michigan Int'l Speedway (Dave DeBois), Iowa Speedway (Gale Nungesser), Music City Motorplex (Dan White), Kentucky Speedway (Mike Claywell, Dan Stuart, Tim Bray and Mike Schmaltz), Talladega Superspeedway (Andrew Smith) and Salem Speedway (Richard and Robin Deaton). A press conference earlier in the day included major Series and team announcements as well as 2008 special awards not distributed at the Championship Awards Banquet. The 2009 ARCA RE/MAX Series will mark the sanctioning body's 57th year of competition and kicks off with the ARCA 200 at Daytona on Saturday, February 7th, live on SPEED. 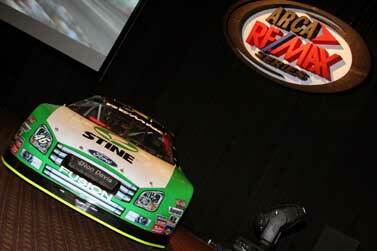 For the complete 2009 ARCA RE/MAX Series schedule, visit www.arcaracing.com.